What the Cha-Cha? Now, I’m not a rookie to the squash scene at this point but I don’t remember ever seeing a Cha-Cha Kabocha Squash on the menu before now. Have you ever had one? 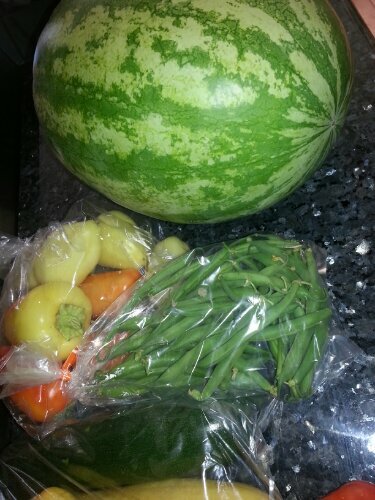 To me, it looks like a big speckled green pumpkin or, maybe, a flatter watermelon But, I was surprised when I picked it up because it was significantly lighter than expected. According to the instructions/newsletter, it is the best-eating of the mid-size kabocha squashes. “It has a bright yellow flesh that cooks up dry, flaky, sweet and delicious.” I’m thinking it will be a lot like a butternut squash … I guess we will find out soon enough, won’t we? In case you didn’t already know, the pick-up spot for my CSA is at the local Whole Foods store. Most of the time, I don’t even go inside unless I need some random other item because, after all, I am going home with a huge box of veggies every week. This week, though, was different. I was stopped dead in my tracks because I found my holy grail item of fall. 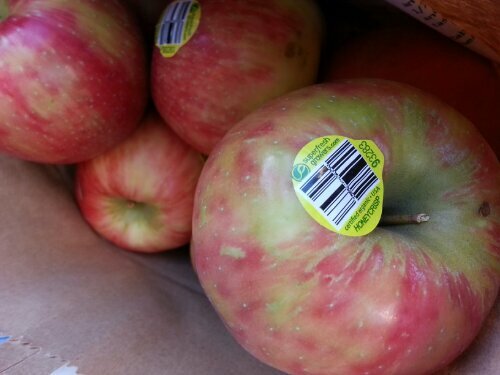 The Honey Crisp Apple. Oooooh, yaaaaa. It’s on like Donkey Kong, my friends. 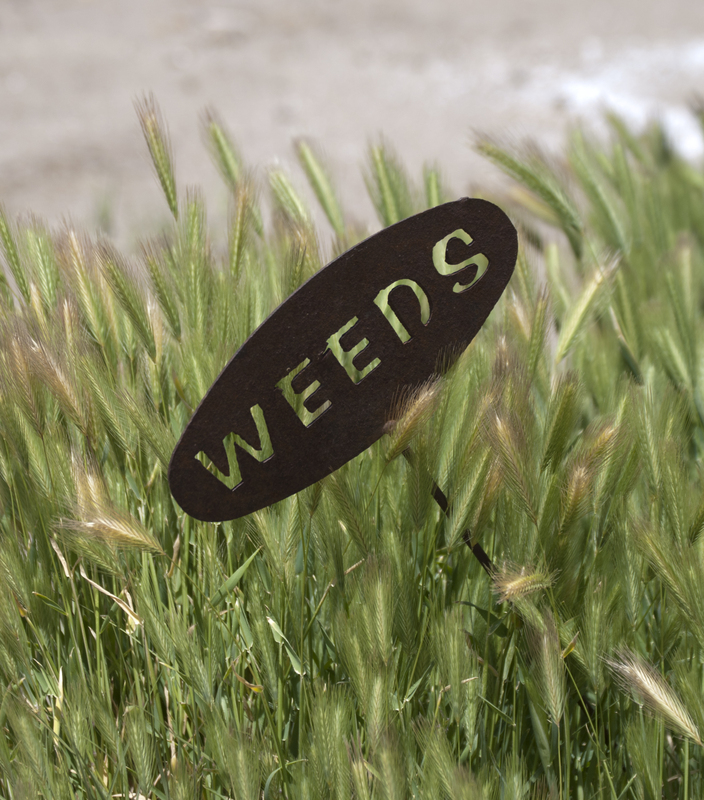 It’s another great week of veggies in Nevada. I am so happy to be back in the CSA. 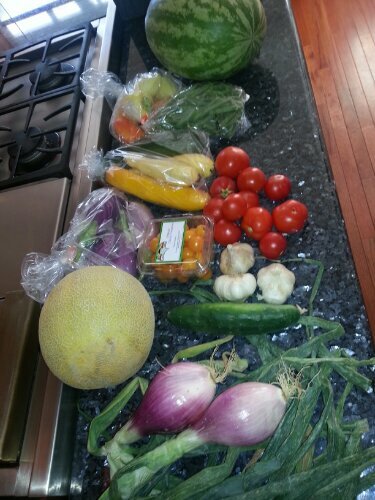 I get super excited for Thursdays because I know there will be a new veggie box. Nom nom nom! What’s this week’s haul? 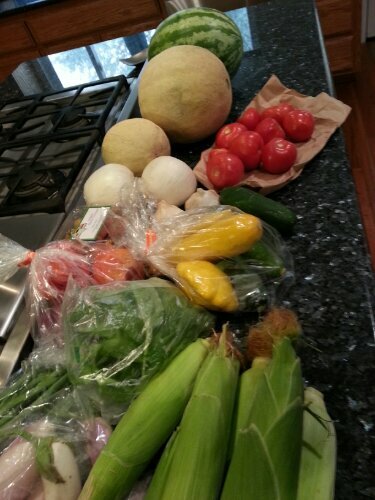 All organic–I know I say that every week but it’s really that important. 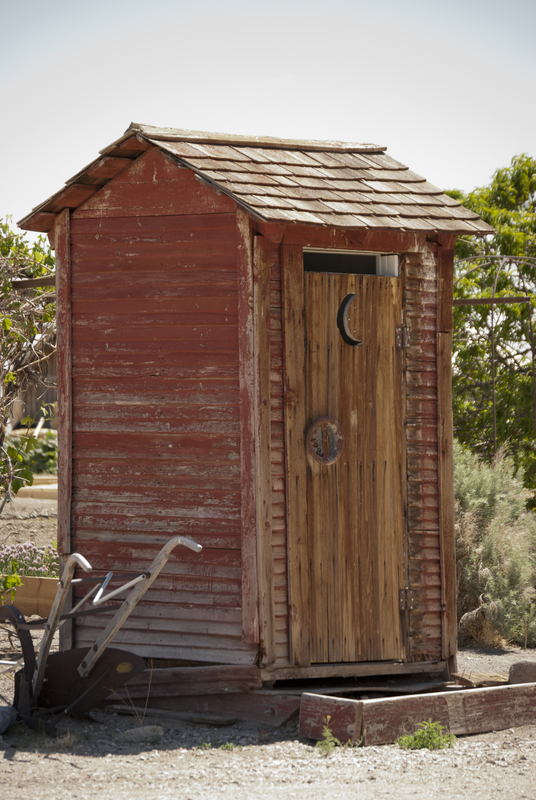 Those peeps out at Lattin Farms work hard to keep their freshies fresh, the old-school way! 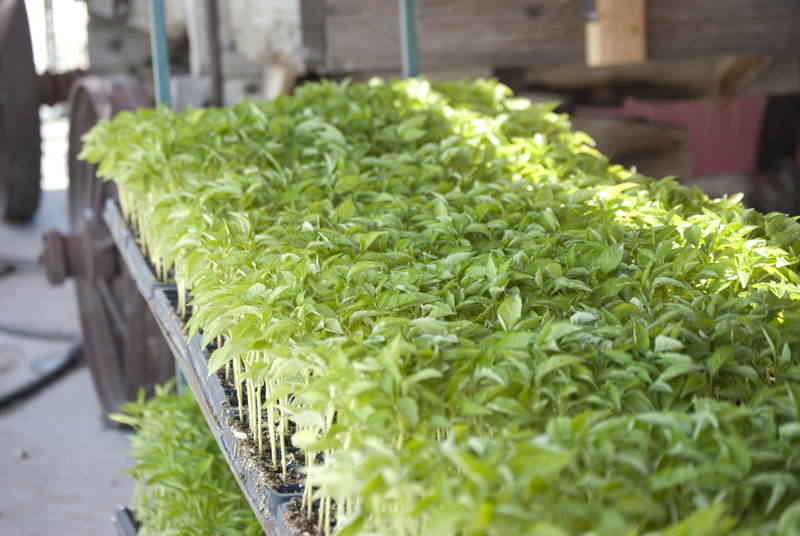 Here’s a close up of the basil — can you smell it? I was trying to inhale the bag on the way home in the car. 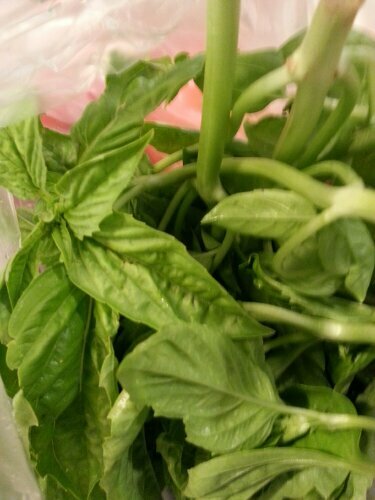 I love fresh basil. 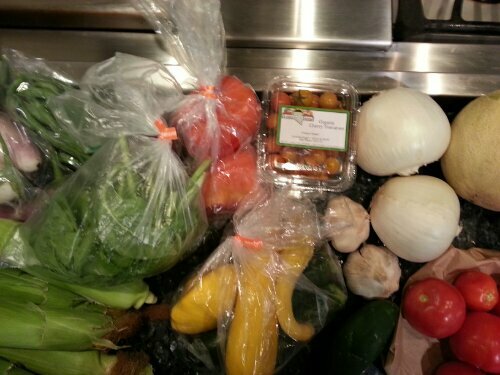 The Veggie Box is Back! 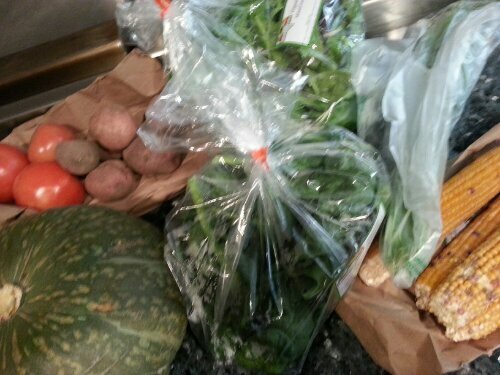 I have returned from the desert wasteland of fresh options in Northern Nevada to report that I should have just stayed with my tried and true CSA box from last year. The co-op in town is good but not convenient for me. The other basket/subscriptions are OK but not always local. 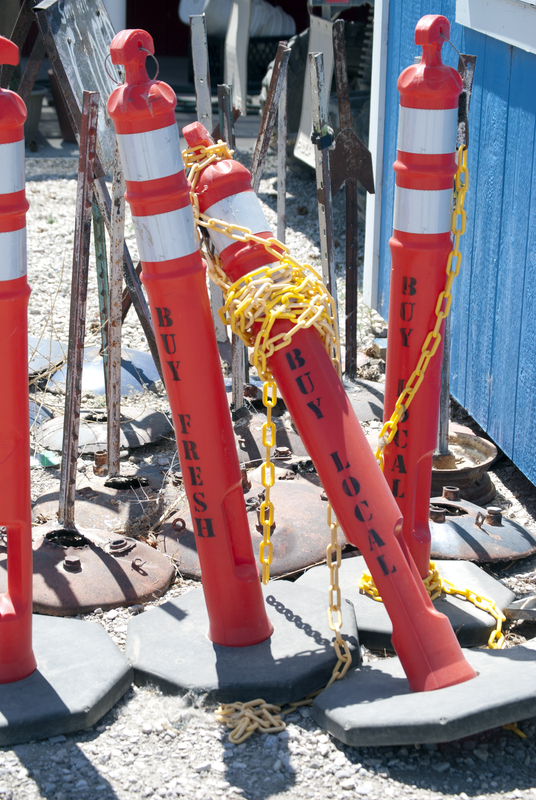 And, the farmer’s markets are less than I had hoped for in my area. 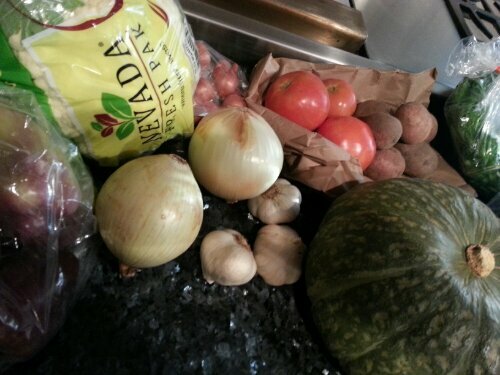 The Great Basin Basket CSA (Community Supported Agriculture) subscription by Lattin Farms is the way to go. For real. Boom. Don’t mess around with anything else. 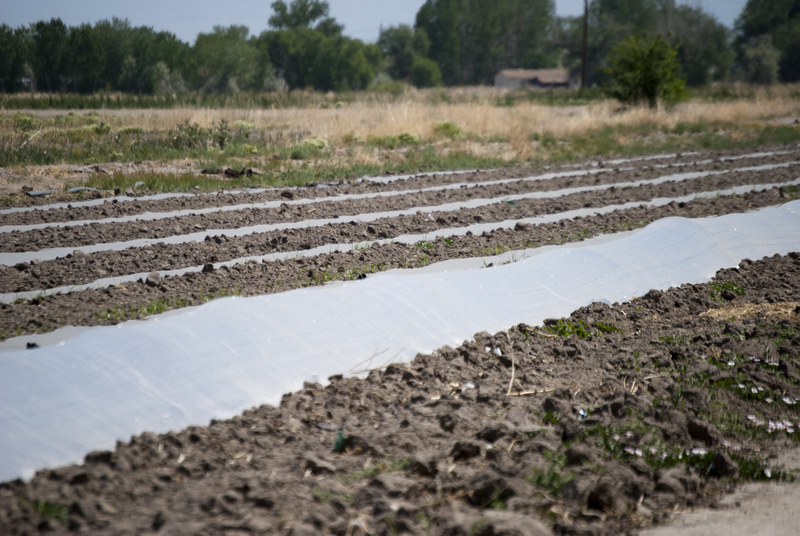 Know that your farmer is in Fallon and your food is fresh. Done. You can expect to see weekly reports from me about what’s in the box through the fall and I will gladly pay whatever the subscription costs because it has always proven to be completely worth it. I managed to get in on the summer subscription after it had already started and the membership coordinator happily pro-rated my weeks through September. This costs $29 a week. Paid in full, in advance with eager anticipation. 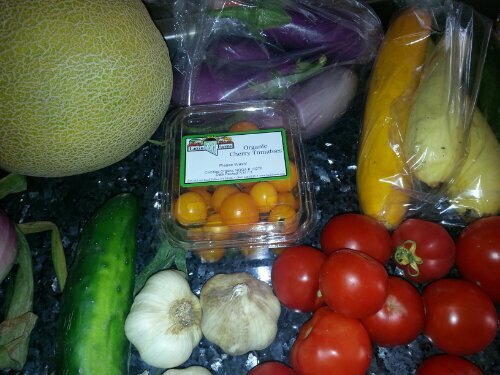 All organic summer squash, seedless watermelon, sweet peppers, eggplant, early girl tomatoes, cherry tomatoes, cucumber, garlic and a Galia melon from Lattin Farms. 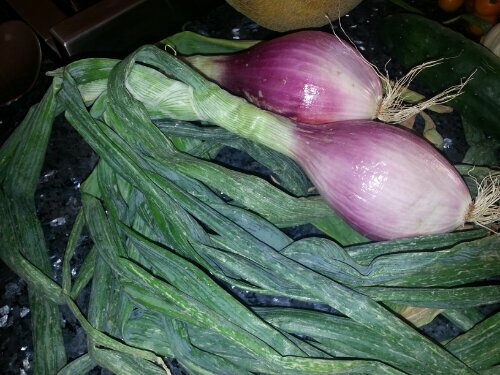 There is also a bag of green beans from River Bend Farms and two big red torpedo onions from Pioneer Farms. What’s a Galia melon? According to the handy dandy instruction sheet that comes in every veggie box, a Galia melon looks “like a cantaloupe on the outside and a honeydew melon on the inside and offer a delicious, sweet flavor.” All I know is that it smells like heaven. This should be really good this weekend when it’s hot outside and I’m craving something cool and sweet. Can you believe that I’m even excited to see the eggplant? 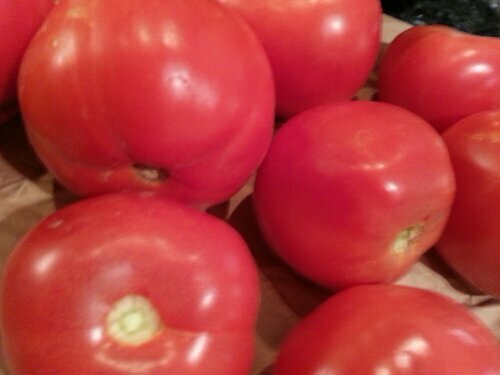 Now, if I could only remember which blog posted an eggplant recipe recently that actually looked good. Any suggestions on that one? I remember these peppers from last summer and can attest … THEY ARE TASTY! I’m excited to try some new recipes and share them with you again. Tonight’s menu is easy: grilled chicken and grilled summer squash. Put ’em on the BBQ and get ‘er done! Yum. Woo hoo! 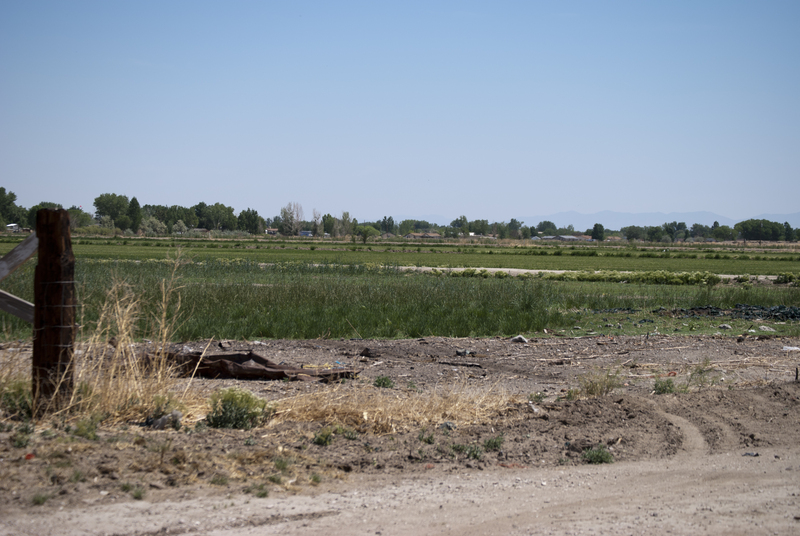 I took a field trip to visit Lattin Farms in Fallon, Nevada. This is where the magical veggies in my weekly CSA box are born. It is about an hour from my house and the area is a mini greenbelt for Nevada. 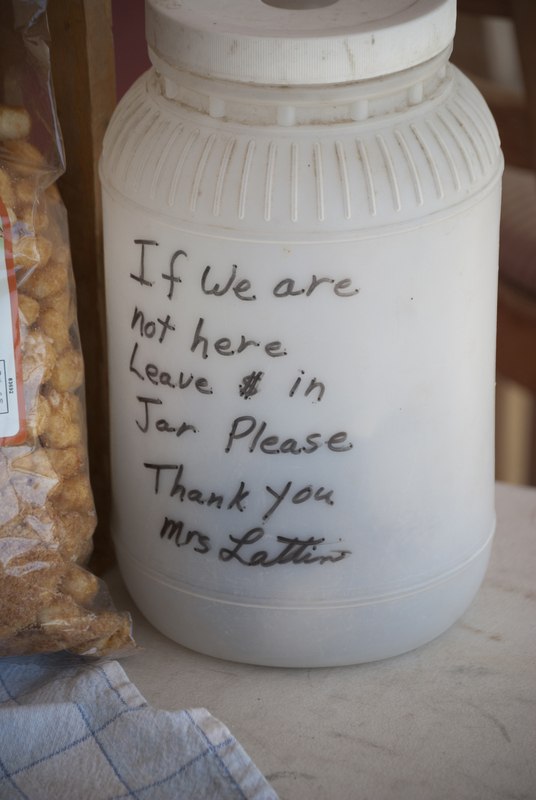 The fine folks at Lattin Farms host all kinds of events throughout the year. It is a fun, little farm to visit on almost any day. 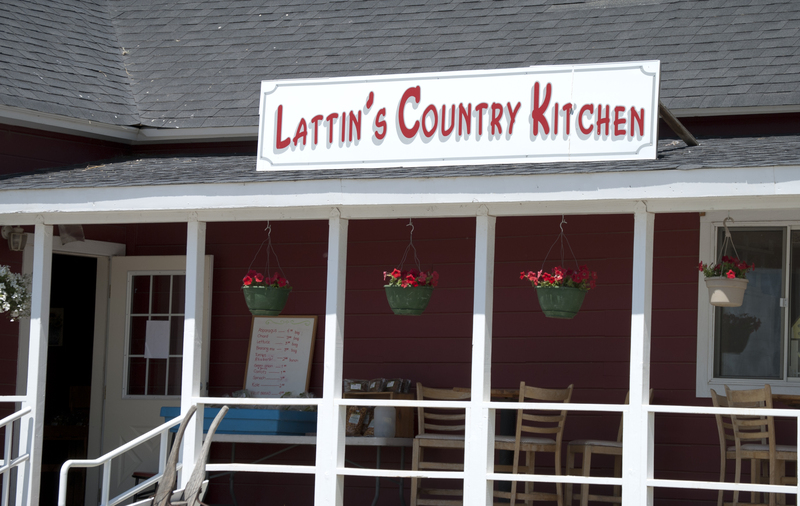 And, even when the crops aren’t all going, you can drop by for a quick bite to eat from the country kitchen. I have a feeling that this plastic jug is rarely ever short of what the sale is supposed to be. Respect and honor it. We did. $4 for some snacks, all good. 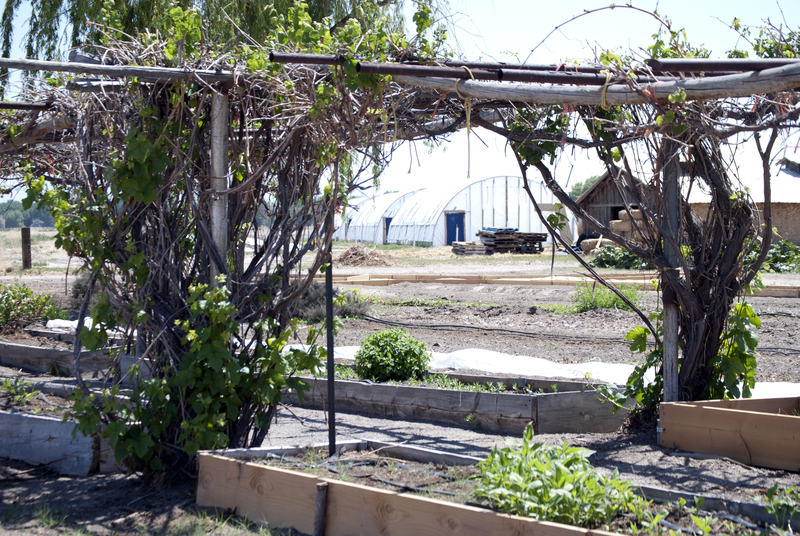 It is still very early in the season here in Northern Nevada so there was more going on in hoops and greenhouses than in the ground but it was still pretty fun just the same. Later in the year, there is a bigger store for all of the produce and a area where I they do events, classes, etc. My favorite time to visit is actually in the fall for the corn maze. Stay tuned for that one in October. Lattin Farms does this up right every year! 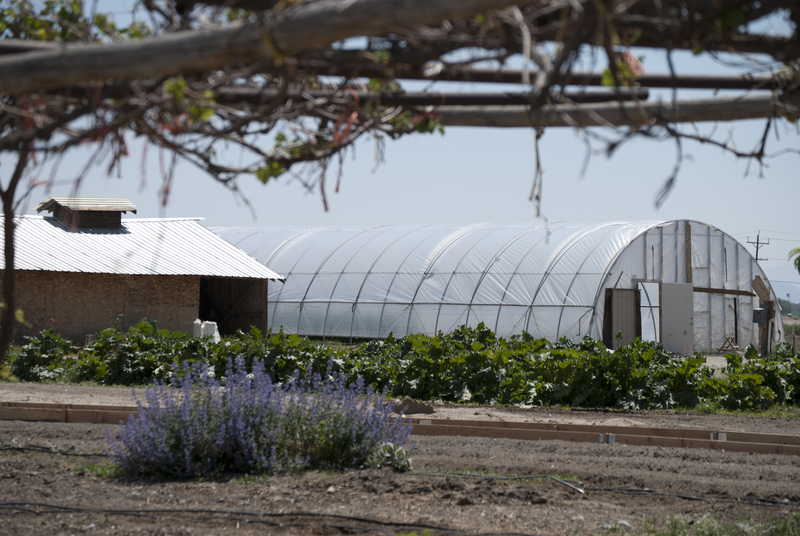 One of the greenhouses … growing most of my greens and other CSA goodies. Looks like some peppers are getting ready to be transplanted. A few things are growing in the planter boxes. I think most people are surprised to find this happening little green spot in the desert. There are always issues with water and whatnot. But, I love it out here. 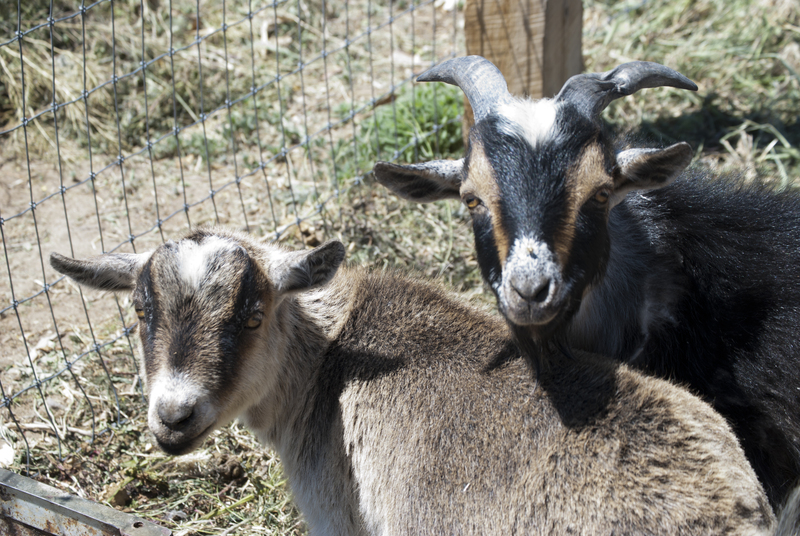 My friend Kristen loves these goats. This picture is pretty much just for her. I didn’t check to see if it was ‘real.’ Ha ha. If you knew how windy it gets in Nevada, you would respect that this is intact. I wonder what’s hiding in there?